Copley Junior School is proud to be registered with Doncaster Children’s University™ as a ‘Learning Destination’. What is the Children’s University? Children's University is an opportunity for children to be rewarded for spending time involved in positive activities outside normal school hours. Children's University is an exciting way for children to learn by having fun and doing things they enjoy! Children record each hour that they do in an activity at a Children's University Learning Destination in the Children's University 'Passport to Learning'. Children are encouraged to work towards national certificates that are issued from the Children’s University. Certificates can be awarded up to 1000 hours. The first award starts with the bronze certificate at the Undergraduate level of 30 hours of learning. When children accumulate enough hours to achieve an award, they will be invited to graduate at an annual ceremony. Wearing a 'cap and gown', they will receive their certificate in front of an invited audience of parents and relatives. A Learning Destination is where your child attends a club. It can be in school such as Magic Club after school or the Choir organised at lunchtime and also includes a variety of places such as The Dome for swimming and ice skating lessons. A Learning Destination is an organisation that offers learning opportunities for children outside normal school hours i.e. before and after school or at lunchtime; they can be in the form of a club, visit or event. A list of Learning Destinations can be found on the Children's University website and the link is provided below or you are welcome to contact the Children's University office on 01302 553791 . A Learning Destination will have the CU logo to show they are a member. Why validate after school learning? National Children’s University® validation provides you with the confidence that what your child is doing is of a good standard and is fun. Throughout the year you will receive information regarding after school clubs that your child may attend, children will collect credits for each hour they spend attending school clubs. The credits are collected in a ‘Passport to Learning’ which is available to buy from school. Children will receive a Children’s University ‘National Award’ once they have reached Bronze (30 hours), Silver (65 hours) and Gold (100 hours) Awards continue up to 1000 hours. Certificates are awarded as children move through the different levels. Each year in recognition of their hard work children are invited to a Graduation Event at Doncaster College. Please note children may only collect credits from validated learning destinations; please contact the Children’s University office for details of validated Learning Destinations. How much do the passports cost? Many thanks to members of our CSA, who kindly decided to subsidise the £3 cost of each passport by £1.50. Passports can therefore be purchased at a cost of £2 from the school office. If lost, replacement passports cost £3.50. How do I know my children’s credits are monitored? Copley Junior School and the other Learning Destinations agree to sign your child’s passport after each club or visit and inform Doncaster Children’s University. Once a term a member of the Children’s University team comes into school and maintains a database of hours that children have completed. They will notify the school when the next Graduation Ceremony will be held and who will be graduating. Please note that children will be expected to keep their passports safe and they will be responsible for presenting their passports for signing in school and at other validated Learning Destinations. Why does Copley Junior School encourage pupils to join? √ Being in the CU significantly improves school attendance. √ Achievement is significantly better at Key Stages 1 to 3 for children who participate compared to non-attenders. 21st May is a very important date for you to bring your passport into school as it is the last count before the graduation. In July 2018 we attended the Children's University Graduation Ceremony at Doncaster Hub. Sixty two of our children 'graduated', having achieved at least 30 hours of extra-curricular learning. Many of our pupils have achieved far more than this - in some cases, over 1000 hours and counting! Thank you to parents/carers who were able to join us for this lovely occasion. During the year, children have received their certificates for each stage of extra-curricular learning and at the Children's University Graduation the children received their Certificate of Participation. Our Children's University graduates of 2018 celebrating their success! 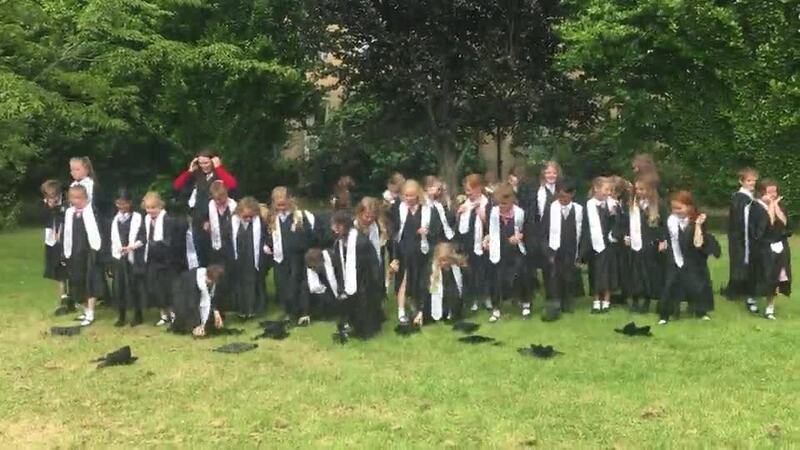 Well done to all our 2018 Children's University graduates! Please click on the first photograph below to view the gallery. Click on the video clip below to watch the children celebrating their success! Well done to Matilda R who won the Art Competition for an original piece of art work inspired by the style of Gustav Klimt. Out of all the participating schools across Doncaster we are very proud to share that Matilda won first place! As her prize, Matilda has been invited to attend a half term Children's University art workshop with a friend. Well done to 62 children who received certificates at the end of the summer term 2018 to mark their success in achieving many hours of learning outside of school. A particular well done to Ella S, who received her Gold Fellowship certificate (the highest award possible) for achieving over 1000 hours of extra-curricular learning! Our Children’s University certificates presented at the end of the summer term totalled an amazing 10 144 hours of extra-curricular learning. This included 80 Bronze awards, 64 Silver awards and 47 Gold awards. Wow! At the end of the autumn term 2018 we celebrated the success of 68 children who all received Children's University certificates, totalling 6050 hours of extra-curricular learning. What a great achievement! Well done to children who received certificates at the end of the spring term 2019 to mark their success in achieving many hours of learning outside of school. A particular well done to Matilda R, who received her Gold Fellowship certificate (the highest award possible) for achieving over 1000 hours of extra-curricular learning! Membership of the Children’s University programme changes as children transfer to secondary school. Children no longer use the passport used in primary school, but may apply for an e-passport. This has an annual subscription charge of £10. If Year 6 children would like to continue their Children’s University journey next year they are welcomed to do so. Please read the leaflet below and contact the Children's University.